State and local governments had high expectations for the suburb surrounding Maroubra Beach in the 1920s. They watched as beachside suburbs further north around Bondi, Bronte and Coogee enjoyed a population explosion, and waited in keen anticipation for the coastal real estate boom to head south. The state government had invested tens of thousands of pounds and recruited unemployed men in clearing the sand dunes behind the beach, and filling in swampy areas, to lay the foundations for the impending residential development. It evicted the last local Chinese market gardeners, Jon Song and Lung Foong, who had been cultivating their ten acre garden behind the beach for 25 years. These men had worked hard to transform the land ‘from a peaty swamp, overgrown with high reeds and other forms of vegetation into a highly productive vegetable garden’, but the government feared their presence might hinder development, and the sporting field that replaced them was far more attractive to investors. 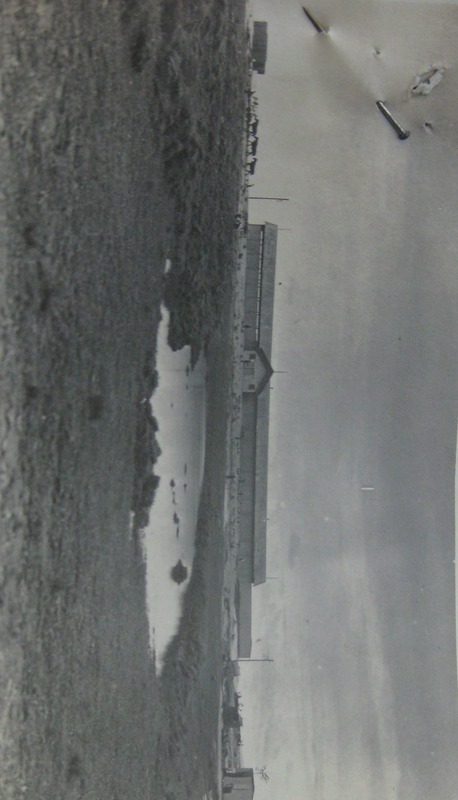 A swampy Maroubra reserve and surf sheds, c.1920s. State Records NSW. What I love about this story is that it was not as simple as the government had hoped. Local residents and the Randwick Council weighed in on the government’s proposal to resume the back corner of the reserve behind the beach, opposing the plan to sacrifice public land for private development. What had seemed a simple compromise to aid local development became embroiled in a broader debate about local requirements for improvements to the beach, including carparks, fresh and salt water baths and a new seawall. The Government got the Council on side by agreeing to fund half of the Council’s planned extension to Marine Parade, but the community campaign against the park resumption heated up. At the height of the tension, 700 people signed a petition demanding freshwater baths, 3-400 turned up to an ‘indignation meeting’ to oppose the council and government plans, and the south ward of the municipality was said to be embroiled in a civil war, when three Aldermen ‘went at it hammer and tongs’ during a council meeting. 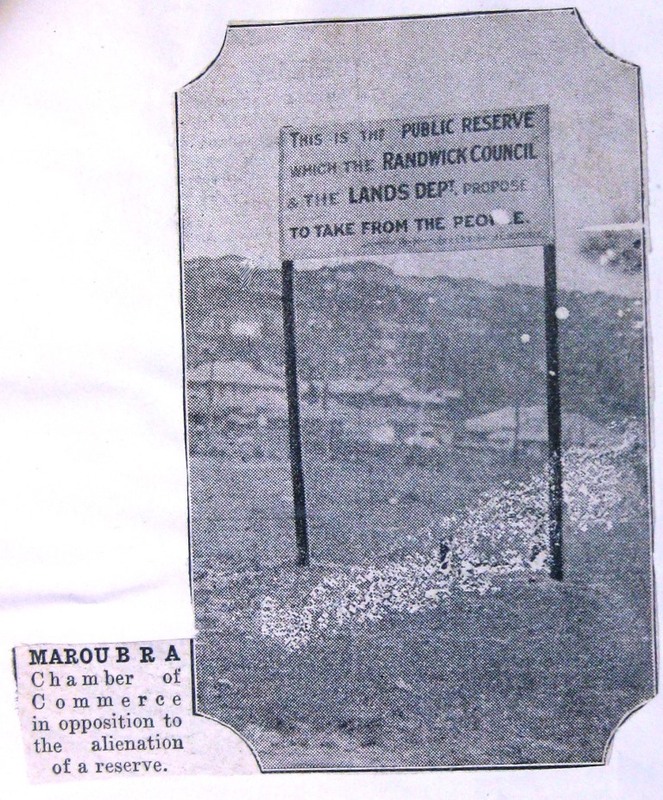 A sign erected in the reserve behind Maroubra Beach in defiance of the government’s planned resumption and subdivision c.1928. State Records NSW. Some people were concerned that the portion intended for subdivision was unsuited to building purposes, and would be better suited to public parking, a demand endorsed by the NRMA on behalf of Sydney motorists. Others were just angry part of the reserve would disappear. The beaches are vital to the wellbeing of the people of Sydney and also of NSW. They are like jewels around the throat of a lady. Overseas and other visitors never go away without congratulating us on our wonderful beaches. Surf bathing had become a national pastime and we should, therefore, jealously guard every inch of space we have got, and Maroubra is the last of the city beaches which has to be developed… The beaches do not belong to the Council, the Lands Department, or anybody but the public. They must be developed in the national interests. The government and council remained insistent in the face of concerted opposition by the local residents and interest groups and continued on their course of resuming part of the park. But in 1930, as the true extent of the impacts of the Great Depression became apparent, the Government abandoned the works citing budgetary pressures. Soon, the same park local residents had fought to be retained in public ownership would be home to unemployed men and their families, evicted from their homes and forced to camp on parks and vacant spaces around the edges of the city. Campers were not new to Maroubra reserves but nor were they welcome. Local residents had another battle on their hands.